Entertainment is an integral part of your wedding. No matter how many tasks you have until the Big Day, find the time to prepare a simple outline of the evening with your wedding planner (or a close friend who is well into wedding planning with you). Hand this schedule to your DJ or live band so they will know what comes when. This is the best way for them to arrange things and make sure your wedding guests are entertained in the best possible way. It will guarantee you that whoever is in charge of your wedding music will make sure the right music is played at the right times. We all know that it is your day and you want it to appeal to you. After all, you are the bride and you deserve to feel like each and every dream you have comes true on your wedding day. When we talk about entertainment, however, you should have in mind that your wedding guests have different tastes in music. Your wedding day is probably not the best time to decide to play only music that you like as this will leave quite too many wedding guests disappointed. The right formula (which will guarantee everyone is happy) includes your personal favorites (of course! ), plus timeless dance classics plus some chart-toppers. And don’t stick to the same genre for too long! This is a very often made mistake that may totally ruin your wedding. Why? Because wedding bands and DJs are living and breathing people so you should meet them in person to see how they get the audience going or just to see if their personality is what you are looking for. A face-to-face meeting prior to the wedding is also a great opportunity to discuss some details with your wedding band or DJ. Remember that such small details (like your first dance song, your not-to-play/perform list, your favorite genre, etc.) are very important but they would be the last thing on your mind on the Big Day! 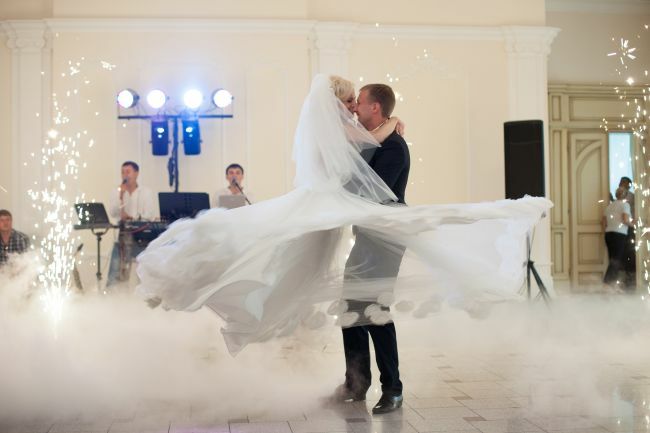 Too many brides are over-obsessed with their first dance song. Some brides spend hours looking for that perfect song and, once they find it, they just cross it from the wedding planning to-do list and forget about it till the wedding reception. What often happens, though, is that the bride has failed to check the length of the song and the first dance turns from a beautiful and romantic scene to a real dance torture for everybody (including the bride and groom). Our suggestion is to always check the length of the track and, if it seems too long, to talk to your DJ or live band about shortening it to reasonable levels. Oh, and, no matter how good you are on the dance floor, some future bride and groom dance lessons won’t hurt. If not anything else, they are tons of fun!